The year was 1973. With Rod Laver and Ken Rosewall, who had together dominated tennis for almost a decade and a half, nearing the end of their careers, the search had begun for the next generation of tennis superstars who would pick up the mantle. The cupboard appeared fairly bare as these two semi-retired gentlemen continued to rule the courts. Two young men who already promised much were Bjorn Borg of Sweden and Jimmy Connors of the United States. At Wimbledon that year, there was a third, Vijay Amritraj from India, who came within two points of upsetting eventual champion Jan Kodes in the fifth set. The press would soon have to pay attention, however. A month later at Bretton Woods, New Hampshire, Amritraj would beat Rod Laver in the semi-finals and Jimmy Connors in the finals to take the $5000 prize money and a new car. The following month, he would again beat Laver, this time at the US Open. After that victory, John Newcombe would remark: “When I played our Davis Cup match in Madras in May, it was something like 130 degrees on the court. Here we were, Vijay and I, in a 10,000-seat Davis Cup stadium that literally had been made out of bamboo and string and put up in 17 days. “It was the most amazing thing I’d ever seen. We quit after a set each, and I remember thinking how uncommonly tough he was then. But after watching him play here at Forest Hills I feel he has the least amount of shots to improve among the young players. Sports Illustrated would famously put the three young guns – Amritraj, Borg and Connors – on the cover and label them the ABC of tennis. Over the next decade and more, Borg would win 11 Grand Slams and Connors would win eight. Amritraj would retire from tennis never having won a Grand Slam. He would beat both Borg and Connors several times throughout their careers, but would never pull together a string of seven consecutive victories in a tournament needed to win a Grand Slam. But between them, they would give us 15 years and more of sublime tennis. Fast forward to 2017, and the ATP is doing what Sports Illustrated tried to do 44-years ago – identify the superstars of the future. Between November 7-11 this year, Milan will witness the ‘Next Generation ATP Finals’, the season-ending event for the best singles players aged 21 and below who are playing on the 2017 ATP World Tour. The top seven players in the ‘Emirates ATP Race to Milan’ will qualify for the event and the eighth spot will be reserved for a wild card. Leading the qualifying pack at the moment, by miles, is the phenomenally talented Alexander ‘Sascha’ Zverev from Germany with 4175 points. Aged 20, Sascha has had a remarkable 18 months where he has moved from a Top 100 ranking at the start of 2016 to being the youngest player in the Top 20 after Novak Djokovic at the end of that year, to being No.6 in the world today. Winning his first ATP title in 2016 at St. Petersburg, Sascha picked up two Masters titles in 2017. He beat Novak Djokovic in straight sets at the Italian Masters, ironically becoming the youngest player since Djokovic himself to win a Masters 1000 and the first player born in the 1990s to do so. Sascha then won the oldest Masters tournament in the world, the Rogers Cup Canadian Open, brushing aside Roger Federer in the final. The other six on the list are bunched together with little to choose between them as far as ATP points are concerned. Karen Kachanov of Russia is undoubtedly talented, but has not displayed any special ability to trouble the ‘Big 4’ of tennis – Nadal, Federer, Djokovic and Andy Murray – despite the injuries and indifferent form that have been the bane of the last two over the past several months. Borna Coric of Croatia, at 21, is an altogether different proposition despite not having an early Masters or Grand Slam success under his belt thus far. At the age of 18 he defeated world No.3 Rafael Nadal at the Swiss Open quarter-finals in 2014, becoming the youngest player to break into the Top 100 since Nadal himself did so in 2003. In 2015, at the Dubai Open, Coric beat world No.3 Murray in straight sets in the quarter-finals. In 2016, Coric again beat Nadal in straight sets at the Cincinnati Open. In May 2017, Murray was a straight sets victim for the second time at the Madrid Open. Coric is a man with immense talent, and clearly one to watch out for. Currently in third place on the list is Jared Donaldson of the United States. Donaldson is probably less fancied than his peers on this list and is indeed on it by virtue of having picked up ATP points by playing several lower-level tournaments. It is early days to take a call on him. In fourth place is one of the youngest players on this list, Andrey Rublev from Russia. At 19, he is an exciting talent indeed. He studies the superstars of today keenly and models his serve on Milos Raonic, tries to manage the physique and foot play examples of Nadal and emulates Federer’s fly play and forehand. He has also spent time with Nadal at his academy. 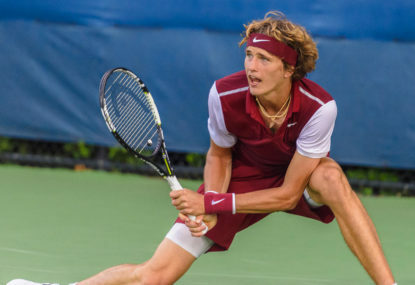 With several victories over Top 20 and Top 10 players, Rublev is making a statement as I write this by entering the quarter-finals of the ongoing US Open, beating David Goffin in straight sets. Twenty-one-year-old Daniil Medvedev of Russia just about makes it into this list in terms of age. Like Donaldson, despite making one ATP final in 2017 at Chennai, Medvedev is currently just making up the numbers in this race, something that could of course change with time. Completing the list is the latest entrant, youngest by some distance and displaying dazzling talent, 18-year-old Denis Shapopalov of Canada. Awarded a wild card for the 2016 Rogers Cup, in only his second ATP senior tournament, Shapopalov upset world No.19 Nick Kyrgios in the first round before losing to Greg Dimitrov. He had to wait for a year, playing ATP Futures tournaments and Challengers, honing his skills, before dazzling an unsuspecting tennis fraternity at the 2017 Rogers Cup with back-to-back victories over Juan Martin Del Potro and world No.2 Rafael Nadal before losing to Sascha Zverev in the semi-finals. Fighting through qualification to the main draw of the US Open, Shapopalov won many hearts with a superb display of tennis, narrowly losing out on a quarter-finals spot with a 6-7, 6-7, 6-7 heartbreaking loss to Pablo Carreno Busta of Spain. But not before he became the youngest player to reach a Grand Slam fourth round since Michael Chang in 1989. From a year ago, when there did not seem to be a strong new group of players coming up who could give us the same pleasure as the current Big 4, today, suddenly, there is hope. As we look to the future, there appears to be reason to be optimistic that Alexander (Zverev), Borna (Coric) and Dennis (Shapopalov) may well be the ABD of tennis that gives us reason to continue watching and enjoying a supremely high quality of tennis. One hesitates to assume that the ABD of tennis will fill the huge hole left by the eventual retirement of the current Big 4, but from a situation of near darkness, suddenly there is a light at the end of the tunnel.